Nest T3007ES 3rd Generation Thermostat - Stainless Steel *NEW*Not Used/No Box📦. Shipped with USPS Priority Mail Small Flat Rate Box. Trending at $160.00eBay determines this price through a machine learned model of the product's sale prices within the last 90 days. Trending at $186.95eBay determines this price through a machine learned model of the product's sale prices within the last 90 days. Open box never used Product Description The 3rd Generation Nest Learning Thermostat has a new, slimmer design, is enclosed by a solid stainless steel ring, and works with 95% of low voltage systems. The Nest Learning Thermostat learns what temperatures you like, turns itself down when you're away and can be controlled from anywhere over Wi-Fi. By programming itself, the Nest thermostat can save up to 20% on your heating and cooling bill. You just have to teach it well. From the Manufacturer The Nest Learning Thermostat programs itself and automatically saves energy when you’re away. Control it from anywhere using your smartphone, tablet or computer. Sporting a gorgeous minimalist design, the Nest Thermostat is designed to improve the convenience and efficiency of nearly any heating and cooling system. Thermostat E turns itself down when you're away. Nest Thermostat E’s energy ­saving features earned an ENERGY STAR from the EPA. Feeling chilly?. Just say, “Ok Google, set my temperature to 72 degrees.". Use the Nest app to change the temperature from anywhere – the beach, the office or your bed. Proven to save energy, the Nest Learning Thermostat is more beautiful than ever, redesigned with a thinner, sleeker design and bigger, sharper display. It includes Display Only. You will receive what pictures show (color maybe different). Model Nest T3007ES. SAVE ENERGY WITH NEST: Nest introduces the 3rd generation Nest Learning Thermostat. Range- Up to 50 feet away from your Nest Thermostat. WORKS WITH NEST: Nest has worked hard to design thoughtful devices to help keep you safe and secure. NEW NEST Learning Smart WiFi Thermostat Model 3rd Generation T3007ES Stainless Steel. Model T3007ES. Thermostat, Backplate, Wall Mount, Wall Covering, Guides and Screws. Nest Learning 3rd Generation Thermostat - Stainless Steel. Condition is New. Shipped with USPS Priority Mail. Includes everything to install, minor scuffs on glass. Nest Thermostat E White Programmable. Condition is New. Shipped with USPS Priority Mail. Item model number : T5001SF. Requires an installed 3rd generation Nest Learning Thermostat or Nest Thermostat E Senses and communicates temperature to compatible Nest thermostats. Works with Select Nest Thermostats. Front of unit is scratched. Trending at $140.00eBay determines this price through a machine learned model of the product's sale prices within the last 90 days. Including Nest Learning Thermostat, 3rd Gen and Nest Thermostat E. Each sensor communicates directly with your Nest thermostat (not included) to keep your bedroom, living room or nursery at the perfect setting. FOR SALE Nest T4000ES Programmable Thermostat E - White. Model # T3019US. Proven to save energy, the Nest Learning Thermostat is more beautiful than ever, redesigned with a thinner, sleeker design and bigger, sharper display. ENERGY STAR: the Nest learning thermostat is the first thermostat to get ENERGY STAR certified. Just place it on a wall or shelf and get the right temperature, right where you want it. Requires an installed Nest Learning Thermostat (3rd generation) or Nest Thermostat E. Range of up to 50 feet away from your Nest thermostat. Nest E Programmable Smart WiFi Thermostat T4000ES - White. Used for less than a year - like new condition. Shipped with USPS Priority Mail. NO APO, NO P.O. Boxes. WORKS WITH NEST: Nest has worked hard to design thoughtful devices to help keep you safe and secure. SAVE ENERGY WITH NEST: Nest introduces the 3rd generation Nest Learning Thermostat. A thinner, sleeker design. Nest Temperature Sensor Bluetooth, White - 3 pack - New Sealed box. Condition is New. Shipped with USPS Priority Mail. Get a 5 year warranty from Nest if a Nest professional installs it for you. WORKS WITH NEST: Nest has worked hard to design thoughtful devices to help keep you safe and secure. SAVE ENERGY WITH NEST: Nest introduces the 3rd generation Nest Learning Thermostat. It’s the best place in the world. MPN T3007ES. 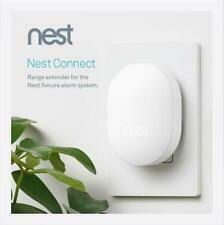 Model Nest T3007ES. This is a used item. It has been used for little over 3 months. It is 3rd generation nest learning thermostat. Type Programmable Thermostat. Manufacturer Color Stainless Steel. Never used. Does not include the base. · WORKS WITH NEST: Nest has worked hard to design thoughtful devices to help keep you safe and secure. · SAVE ENERGY WITH NEST: Nest introduces the 3rd generation Nest Learning Thermostat. A thinner, sleeker design. Nest T3007ES 3rd Generation Learning Programmable Thermostat - Stainless Steel. Condition is Used but in excellent condition. Comes in original box work back plate. Shipped with USPS Priority Mail. 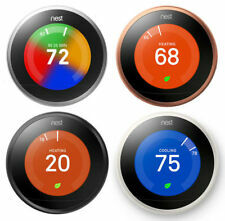 Nest introduces the 3rd generation Nest Learning Thermostat. A thinner, sleeker design. A bigger, sharper display. The 3rd generation Nest Learning Thermostat is more beautiful than ever. And the Nest Thermostat is proven to save energy. Nest 3rd Generation Learning Programmable Thermostat. Color: White. Nest 3rd Gen Learning Programmable Thermostat - Stainless Steel (T3007ES). Condition is New. Shipped with USPS Priority Mail. A company dedicated to making your home better, Nest creates an array of products that helps your home to take care of you just as much as you look after it. Their products offer simple, beautiful home solutions that reduce your footprint and save you money on upkeep and utility bills in a number of areas. eBay continues to carry Nest’s full catalogue, allowing you the customer to buy direct from the brand. What is the Nest Cam? ● Real-time surveillance and alerts. A Nest outdoor camera senses movement in your yard and sends an alert to your phone. You can see the live video feed and even speak into the app to ward off intruders. ● Nest Aware. These cameras know the difference between a person or the odd roving critter or falling debris, and it will tell you if a person is in your yard. ● Specialized alerts. Get specific alerts if there is activity in special areas of your yard or home, such as your driveway or back door. ● Home surveillance. Nest indoor cameras can bring you all the same functions as their outdoor devices. What's So Special About the Nest Thermostat? ● Learn your preferences: Nest thermostats know how warm or cool you like it to be, and then it builds a schedule that matches yours. ● Save on heating and cooling: Studies showed people saving 10 to 15 percent on utility bills with the use of the nest thermostat, and the brand even claims that in under two years, it will have offset what it cost you to buy it. These are just the first steps to fully automating your smart home. For instance, Nest doorbells tell you who's there and when, with full HD video and a number of functions. It streams 24/7, so you can check from your phone whether there's a person or a package at your door, day or night. Another product that can improve any home is the Nest co2 alarm, the Nest Protect. These are an update to traditional smoke and co2 alarms. Lasting for as much as a decade, they test themselves, and you can hush them from your phone when they go off. What's more, they are smart about what they detect, knowing the difference between smoke and co2 and providing warnings when your toast is burning before there's a major fire. When one goes off, they all go off. So even in a big home, if something goes aflame you and everyone in your house know right away.